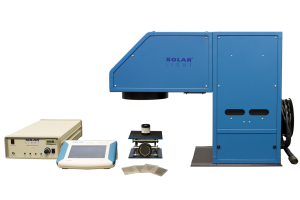 Solar Light’s precision research-grade instruments are specifically designed for the pre-irradiation step during in vitro broad spectrum sunscreen testing, and are fully compliant with the most current FDA and ISO requirements. Installation Qualification (IQ) and Operation Qualification (OQ) documentation, as well as ISO24443 Spectral Validation Certification, are available optionally. 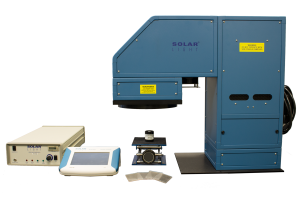 Everything required for instant testing right out of the crate is included direct from the factory: Solar Simulator, Power Supply, Automatic Dose Controller / Radiometer, NIST-traceable PMA-Series Erythema and UVA Sensors, molded or sandblasted PMMA Plates, and all related accessories! 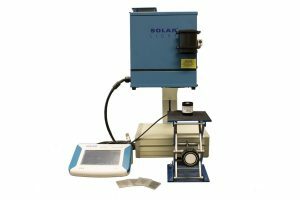 1000W Pre-Irradiation Solar Simulator Kit specifically designed for the pre-irradiation step during in vitro broad spectrum sunscreen testing. Fully compliant with the most current FDA and ISO requirements. The 4″ (10 cm) Class A beam can irradiate up to 4 PMMA plates simultaneously.